She is Russian, born in Vladivostok. She is the young owner of the Fattoria. She lived in Moscow until the age of 16 and moved to England in order to complete her school. Valeria graduated from both City University London and King’s College London with a Bachelor in Law and Master in Law degrees respectively. Her family always dreamt about having an estate in Italy and making wine. After a long search, Valeria and her family found Montemaggio. Seeing its enormous potential, Valeria threw herself completely into the world of wine, learning as much as she could while studying and working. 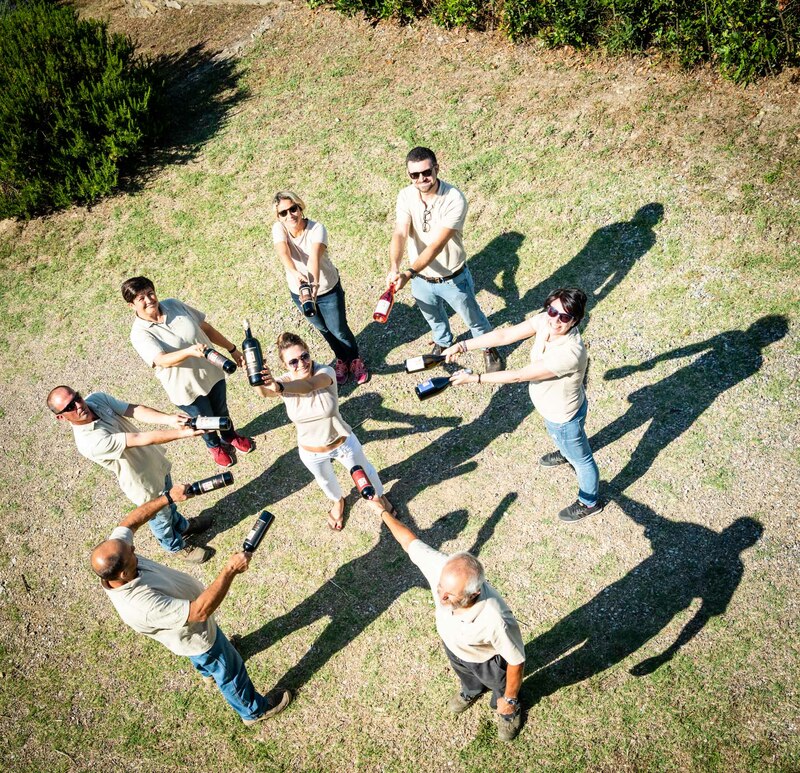 She deals predominantly with the marketing and social media of the Montemaggio wines. Valeria lives at Montemaggio with her husband and their two dogs. Valeria has a great love for reading, cinema and especially for wine and the countryside. She was born in Florence. Her family has long been present in the Chianti region and were wine growers in the past. She is an agronomist and the manager of the estate. After her degree from the University of Agronomy in Florence, she worked in some wineries abroad, in Australia and in Bordeaux in France. However, she always dreamt of coming back to the Chianti region and to work at a small estate, where she could do a bit of everything. The dream came true with Montemaggio, and she has been here ever since. She has worked at Montemaggio since 2005. Ilaria deals with the estate in general, such as grape growing, winemaking, and partially with the sales. She has an enormous passion for agriculture, and the world of wine with all its customs and traditions. Ilaria also enjoys the countryside, sea and sailing. He was born in the Chianti region, in the town of San Casciano. He has been working at Montemaggio since 1996. He graduated from the University of Agronomy in Florence and thereafter started to work at Marchesi Antinori in Tuscany. Andrea worked for this Antinori for many years but then decided to leave and become an independent consultant. Currently he is working as a consultant for many estates in Italy and abroad; a perfectionist, who is always available to give suggestions and find solutions. His philosophy is that wine, first of all, is made in the vineyards. He says that although Montemaggio does experience some difficult working conditions, they have always been able to make very good wine. A true Chianti Classico and a true Sangiovese wine; a Tuscan wine with a very simple but genuine taste. Andrea is passionate about the earth and the world of the sea. He was born in Lucca, he is a geologist and has a master degree from the University of Pisa in geological mapping and geochemistry. After graduation, he left Italy and spent almost 2 years in Australia. Downunder he found his passion for the wine world. He started to work in a winery for a huge company (Domaine Chandon Australia) and got lots of experience in the making of sparkling wine. He has been to France, close to Châteauneuf du Pape for the harvest 2015 in order to improve his experience with red wines. Actually, he has six harvests under his belt. He loves mountain and sports in particular hiking, skiing, fishing, and bicycling. She was born in Siena, but she has always lived in Radda in Chianti where both her grandfathers were farmers. They made wine and she says she remembers that when she was a child, she loved to go to the vineyards with them. After school, she lived for some months in England to improve her English and then she started to work in tourism, mostly in hotels, becoming a hotel manager. After the birth of her daughter, she decided to change jobs to spend more time with her and she rediscovered the world of wine with Montemaggio. He was born in Pisa, but he has lived all his life in Greve in Chianti. His grandfather was a cellarman at a winery and his father is a geologist and a big wine enthusiast. He is studying Marketing and Communication and he is currently working on a thesis about web marketing for wineries. Therefore, he decided that he wanted to work extra and was lucky to get an opportunity at Fattoria di Montemaggio where he helps to manage the wine tours. Other than wine, I am very passionate about music. In fact, I play the guitar and collect vinyl records. He was born in Calenzano, a small town near Prato. He worked as a shipping agent for several years. He has worked in the agriculture field since 1994. He is passionate about yoga. He is from Bosnia and moved to Italy in 1992. When he was in Bosnia, he was a turner. In Italy, he worked in several farms and then he started working at Montemaggio as a tractor driver and worker in the vineyards. He is also involved in the extra virgin olive oil production, gardening, woodworking and DIY activities when needed. For health reasons, he can no longer drive the tractor, but he takes care of all the rest. He loves walking, the mountain, and fishing. She was born in Bosnia and arrived in Italy when she was 23 years old with her husband Saijd and two children. She started working at Montemaggio after her husband in 2012. Like her husband, she worked at several farms before. At Montemaggio, she looks after the gardening, the cleaning and welcoming of the guests. She likes walking, the sea, and travelling. He is from Albania and worked for a company that sold medical plants. He moved to Italy in 1997 and worked as a carpenter and, in 2009 as a farm worker. At Montemaggio, he started as a grape picker and since 2013, he has been a farm worker and handyman. He just took the driving license for the tractor, but he still needs more experience. He loves soccer and movies.